Hands and board with vegetables. Sliced burger bun. Sliced black bun and sauce. Bottle pouring mayonnaise. 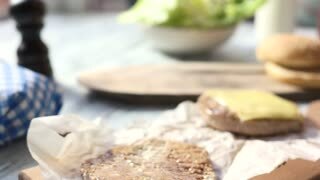 Board and sliced burger bun. Hand with mayonnaise bottle. Sliced buns in pan. Hand, spatula and patty. Black burger bun and lettuce. Slices of pickled cucumber. Pies on the shelves. Production of flour products. 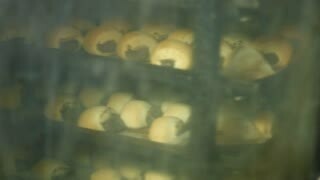 Buns in the furnace. Fresh buns with poppy. Exclusive desserts. 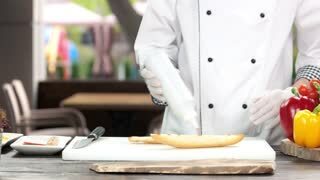 Chef making sandwich. Sliced bun and ketchup. Chef making a burger, sauce. Sliced sesame bun.